If there's one thing I use religiously, it's sunscreen. I have dark spots on my face and I don't plan getting any more. I wish I had known earlier in my life about sun protection.. In my teens I spent a lot of my time on a bike. Without sunscreen. I think that's the reason why I have the pigmentation problem going on on my face. Since I've learnt that protection against the sun is something that can't be left out in your beauty routine, I have incorporated that in my morning routine. I find that I struggle with the greasiness of sunscreen underneath my makeup. I am constantly on the lookout for a non greasy sun screen. I have found a few in the past years, but I never found one that I could re-apply during the day without ruining my makeup. 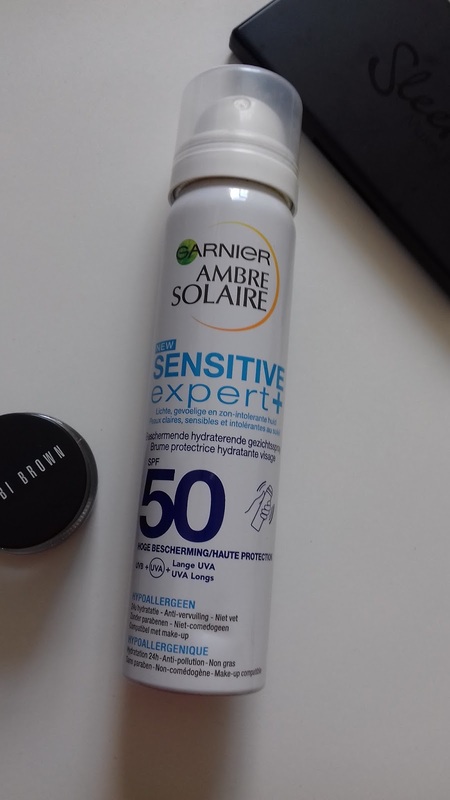 BUT Garnier came out with a sunscreen spray, that is suitable for under your makeup and since it's in a spray, I think it is pretty much suitable for re-applying without ruining your makeup! I always use SPF50, sometimes SPF30, when the SPF50 is not available or during the winter. This spray had SPF50 in it, which is perfect. It contains 75 ml and is suitable for light, sensitive and sun-intolerant skin. The packaging is not very big, so it's doesn't take that much space in your purse (perfect!). 24 hours hydration, anti-pollution, not greasy, without parabens, non-comedogenic and compatible with makeup. Sounds great! On to the review! I apply it after my moisturizer, but before my primer. It comes out in a very fine mist. It's so fine that sometimes I'm not sure if I've covered my face properly, but when I put the spray closer to my face, I can feel the product being sprayed on my face (not really evenly, so you have to make sure to keep about 15 cm distance from your face). I also have the feeling that I waste a lot of product, because after I sprayed it on my face I have to hold my breath for a few seconds, because otherwise I kind of choke in it (I have the same problem with hairspray and certain deodorants). It is indeed not greasy at all and I love that. There's almost nothing I hate more than my face being all greasy. My makeup goes on as it normally would and I think that's great. It does contain perfume and I like the scent. It smells like sunscreen, nothing special. I used the spray a few weeks in my morning routine and I find it perfect for re-applying sunscreen, especially after a workout sessions, which requires a lot of wiping off the sweat on my face. I took it with me on holiday and used it on my body too (only shoulders). I went to Spain and Portugal so it was the perfect place to test out this sunscreen. I sprayed it on my shoulders and was good to go. I have to say that I didn't re-apply, even though I did take the spray with me. It leaves so much product in the air, I can't simply spray it in public on my face without making other people choke on it (a woman in the changing room of my gym "subtly" let me know). When I got to the apartment my shoulders were slightly burnt. But you could see a "track" where I didn't keep distance with my skin and where I could feel there was more product applied than where I did keep a 15 cm distance with my skin. I guess when you spray a generous amount of sunscreen you would be protected from sunburn and the sun, but when you simply go over you skin once, you should re-apply to prevent a sunburn. But you are supposed to re-apply anyway actually. But from this experience I have learned that the protection is not as high as it can be with the way I apply it. I don't use it in my morning routine anymore. I don't think it gives me enough sun protection and I also think it runs out really fast. Much faster than a sunscreen in cream formula. I keep it in my gym bag now and use it every time I finished a workout. I think for me that is a perfect use for the product. I prefer sun screens in a formula that requires applying with my hands over an aerosol, because then I know exactly how much I applied. I feel like more than half of the product goes to waste and my little heart can't take that, lol. I like it for re-applying sun screen, but for me, it's not for in my morning routine. I started using this product on July 21st and I finished it a few days ago. It lasted for about 2 months, but I didn't use it every day. I think if I used it daily, it would have lasted for about one month. I love the idea of this product, but it runs out way too fast for me. Do you use sun screen every day? And which one do you use?